The Gulf of Mexico (GoM) is an important global hotspot that comprises over 2.1615 million hectares of blue carbon habitats, including mangroves, seagrasses, and salt marshes, which collectively store 480.5 Tg of organic carbon (Corg) just in the upper 1 meter of sediment. Some of these important areas of carbon sequestration are protected or conserved, but much of the area is vulnerable, as 69 million people (US and Mexico) live within 50 miles of these blue carbon habitats, so the potential for development and subsequent habitat loss is high. In a recent study published in Science of the Total Environment, the estuaries around the GoM were delineated to determine areal extent and associated carbon stocks for all three habitats. 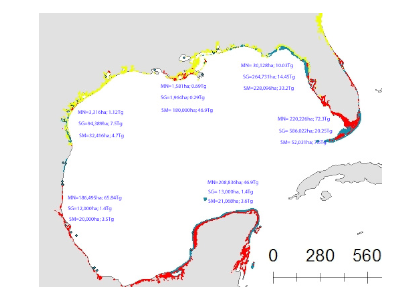 Figure 1: Map of blue carbon extent and stock for six sub-regions in the Gulf of Mexico estuaries and the Florida Shelf. The areal extent in hectares (ha) and associated organic carbon (Corg) stock in Tg is listed for each blue carbon system (MN = mangroves, SG = seagrass, SM = saltmarsh) in each sub-region. The underlying blue carbon map shows the distribution of mangroves (red), saltmarsh (yellow), and seagrass (blue) (used with permission from Chmura and Short, 2015). Of the GoM blue carbon systems studied, mangroves sequester the most carbon, storing nearly 200 Tg Corg over 650,482 ha (Figure 1). Seagrass is ubiquitous throughout the GoM basin, spanning over 1 million ha and storing 184 Tg Corg, Salt marshes, which are predominantly found in the northwestern quadrant of the GoM account for just under 100 Tg Corg. In addition to presenting these updated blue carbon stock estimates for the GoM, this study estimates anthropogenic impacts on GoM blue carbon storage and compares GoM vs. Atlantic shoreline blue carbon habitat stocks and extents. Seagrasses have died-off in great numbers, resulting in the release of stored carbon. Seagrasses represent a substantive and relatively unconstrained North American and Caribbean Sea blue carbon sink in the tropical Western Hemisphere. Fine-scale estimates of regional seagrass carbon stocks, as well as carbon fluxes from anthropogenic disturbances and natural processes and gains in sedimentary carbon from seagrass restoration are currently lacking for the bulk of tropical Western Hemisphere seagrass systems. To address this knowledge gap, in the subtropics and tropics, a recent study yielded estimates of organic carbon (Corg) stocks, losses, and restoration gains from several seagrass beds around the Gulf of Mexico (GoM). GoM-wide seagrass natural Corg stocks were estimated to be ~37.2–37.5Tg Corg. 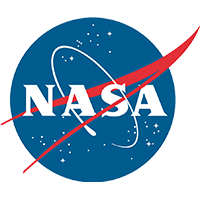 A unique method involving quadruplicate sampling in naturally-occurring, restored, continually-historically barren, and previously-disturbed-now-barren sites provided the first available Corg loss measurements for subtropical-tropical seagrasses. GoM Corg losses were slow, occurring over multiple years, and differed between sites, depending on disturbance type. 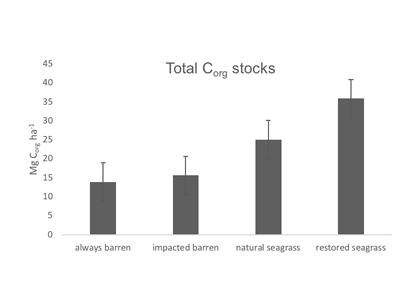 Mean restored seagrass bed Corg stocks exceeded those of natural seagrass beds, underscoring the importance of seagrass restoration as a viable carbon sequestration strategy. For restored seagrass areas, the older the restoration site, the greater the Corg stock. 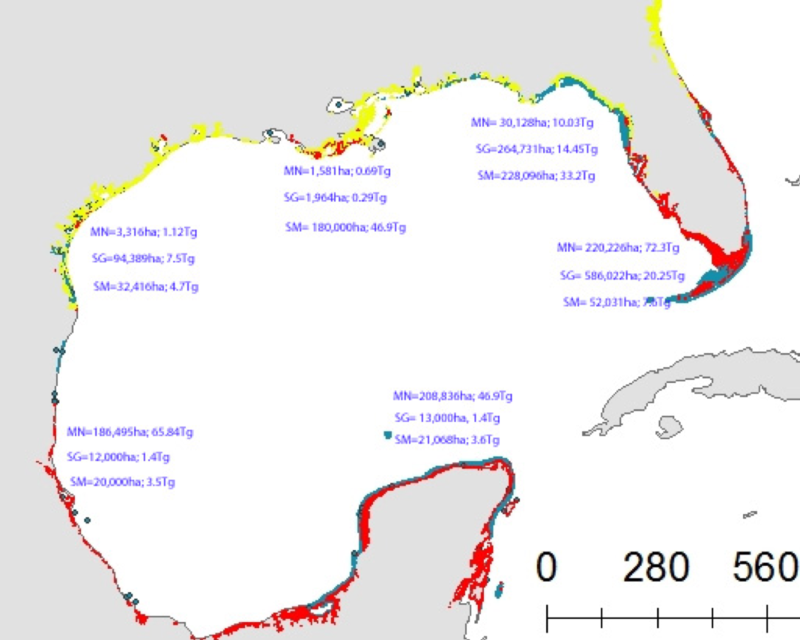 Organic carbon stocks for Gulf of Mexico sediments for the top 20 cm of sediment in always barren, impacted barren, natural seagrass, and restored seagrass sites. 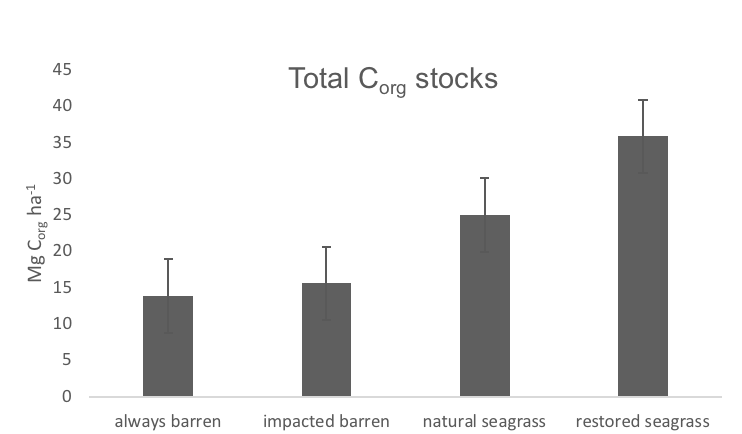 Natural and restored seagrass beds had significantly higher organic carbon stocks than impacted barren or always barren sediments. Seagrass restoration appears to be an important tool for climate-change mitigation. In the USA and throughout the tropics and subtropics, restoration could reduce sedimentary carbon leakage and bolster total blue carbon stores, while facilitating increased fisheries and shoreline stability. Although well-planned and executed restoration of seagrass is more difficult than mangroves or marshes, there are >1 million hectares of degraded seagrass habitats that could be restored, which would greatly increase blue carbon sinks and support diverse marine species that rely on seagrass for habitat and food. Under the increasing threat of climate change, conservation practitioners and policy makers are seeking innovative and data–driven recommendations for mitigating emissions and increasing natural carbon sinks through nature-based solutions. 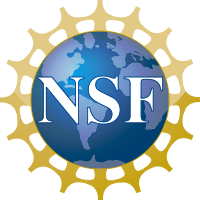 While the ocean and terrestrial forests, and more recently, coastal wetlands, are well known carbon sinks, there is interest in exploring the carbon storage potential of other coastal and marine ecosystems such as coral reefs, kelp forests, phytoplankton, planktonic calcifiers, krill, and teleost fish. A recent study in Frontiers in Ecology and the Environment reviewed the potential and feasibility of managing these other coastal and marine ecosystems for climate mitigation. The authors concluded, that while important parts of the carbon cycle, coral reefs, kelp forests, planktonic calcifiers, krill, and teleost fish do not represent long-term carbon stores, and in the case of fish, do not represent a sequestration pathway. Phytoplankton do sequester globally significant amounts of carbon and contribute to long-term carbon storage in the deep ocean, but there is currently no good way to manage them to increase their carbon storage capacity; additionally, the vast majority of phytoplankton is located in international waters that are outside national jurisdictions, making it very difficult to include them in current climate mitigation policy frameworks. 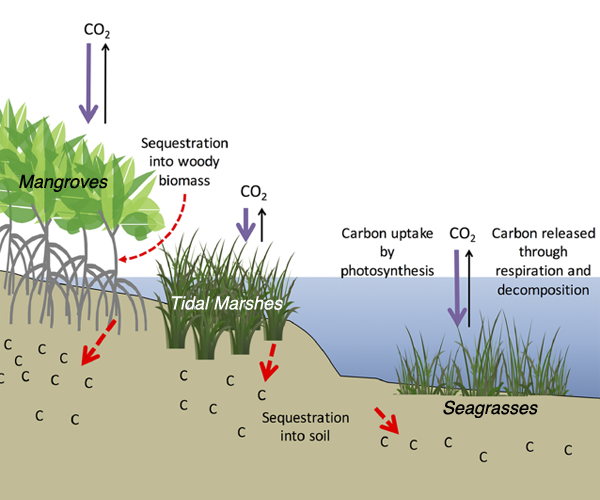 Comparatively, coastal wetlands (mangroves, tidal marshes, and seagrasses) effectively sequester carbon long-term (up to 10x more carbon stored per unit area than terrestrial forests with 50-90% of the stored carbon residing in the soil), and fall within clear national jurisdictions, which facilitates effective and quantifiable management actions. In addition, wetland degradation has the potential to release vast amounts of stored carbon back into the atmosphere and water column, meaning that conservation and restoration of these systems can also reduce potential emissions. The authors conclude that coastal wetland protection and restoration should be a primary focus in comprehensive climate change mitigation plans along with reducing emissions.